Bear Sighting at Chick Evans! 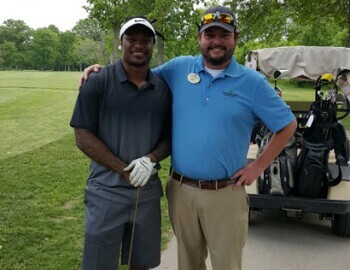 Super Bowl Champion and 2-Time Pro Bowler Tim Jennings played a round of golf at Chick Evans on Thursday, and can be seen here with Assistant GM Jimmy Wilkinson, Jr. Jennings is an integral part of the Chicago Bear's defense and lead the NFL in interceptions in 2012. We wish him and the Bears good luck this season!